I really, truly did not know what to expect once I jumped into this novel. I've never read any works by Sophie Jordan and the idea itself for this book was pretty original. Like, really? A killer gene? Sign me up for that! So, yeah. As you can probably tell, I was super excited to read this book. Plus, that cover is pretty sweet looking. And look at her hair! They make little DNA strands! To begin with, while she had an awesome name, Davy didn't evoke much of an emotional response from me. Now thinking on the book, nothing unique stood out from her in my opinion. But, she wasn't intolerable, and I did like her. She goes from riches and spoils to mistreatment and constant fear and her adaptation to her new situation was interesting to watch. I always get fired up over mistreatment of others and inequality, and while reading this novel, I was going crazy. It's so sad--and fascinating--to see how people react to something they don't know and ultimately see it as a danger. Those tested positive of having HTS are discriminated, segregated, stripped of their rights, publicly ridiculed, and much more. It was just crazy and scary to read about, to see human nature at its worst. I was angry! How could people do this to one another? Just completely despicable! And because of this, and an interesting plot, I tore through this book. There's a lot of dynamic to the characters in this book and it kind of makes you wonder: Who are the real monsters? Those with a killer gene (or an excuse for why people are homicidal, in my opinion) or those who dictate who the monsters are? And a great example of one of those dynamic characters would be Sean, who in reality would scare the ever-living bejesus out of me. Like, was he good, was he bad? I don't know but he sure had a nice bod. 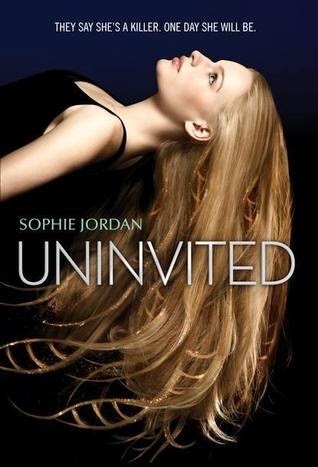 Uninvited was a nice surprise. I think I'll read more from this author because I certainly enjoyed this one. Also, she'll be going on the Dark Days tour and I definitely plan on being there! For fans of dystopia or tales of the oppressed, I think this will make a great read.